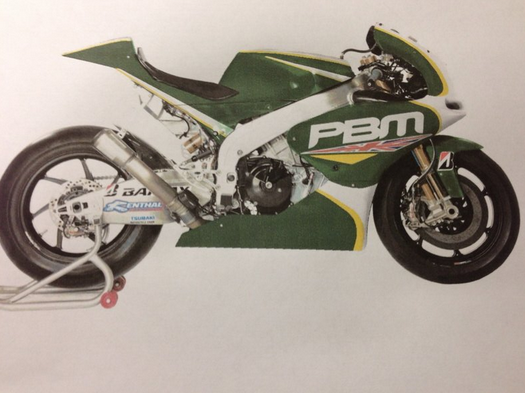 Paul Bird has given a sneak preview of the 2013 PBMUK CRT livery to those who follow him on Twitter. The other day Bird revealed that this year’s bikes would be painted British racing green and white rather than the red, white and blue of last year. The images revealed on twitter show the Aprilia ART machine in green, white and yellow. This comes on the same day that PBM rider Michael Laverty took the 2012 Aprilia ART to second fastest CRT on the testing timesheets in Sepang. The 2013 PBM machine will be Aprilia-engined with a British built chassis, however this machine wasn’t ready in time for for the first test. PBM’s second rider, Hernandez ended the test in 25th. The new PBM machines are expected to be ready in time for the second Sepang test, 26-28 February. Previous Previous post: Crutchlow right behind top four, Smith consistent.